If you're a native English speaker and you've lived in Prague for a long time, it can feel like a small village. If I don't know you, I bet I know someone you know. This "One Degree of Separation" principle applies to expat American chef, Jeff Cohen. Our circles overlap slightly, and I've run into him a few times over the years. Cohen was the opening chef and creator of the international menu at Artisan. It was well-regarded by many, including me. 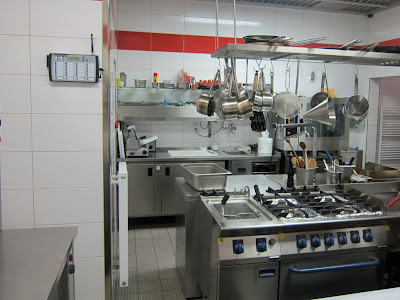 Then he worked in the kitchen at Kampa Group's Hergetova Cihelna. 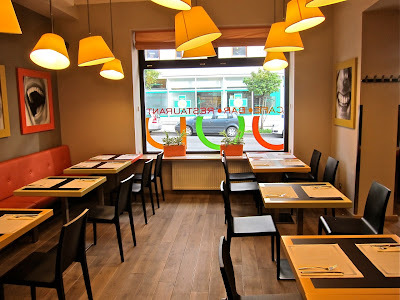 I had some very enjoyable meals there. Now he's the head chef at the new Mood Restaurant. 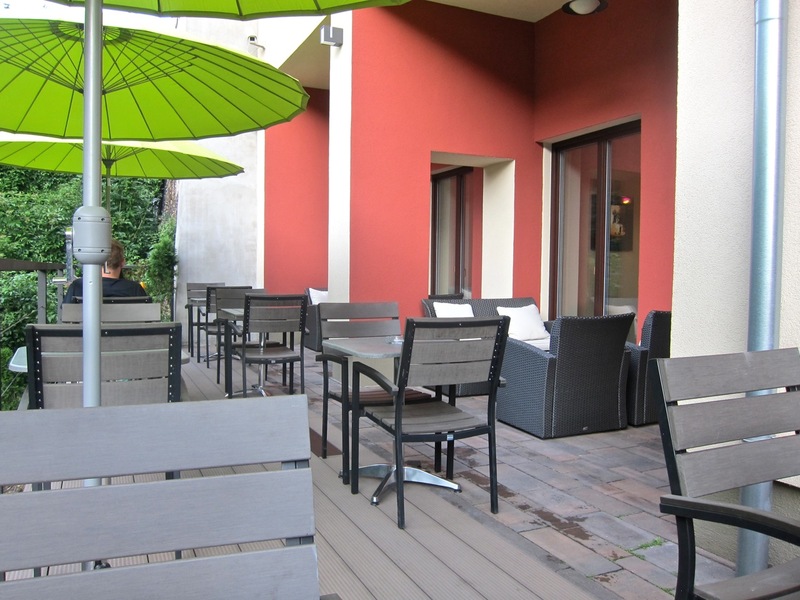 It's in the richly renovated boutique Hotel Voyage in Žižkov. 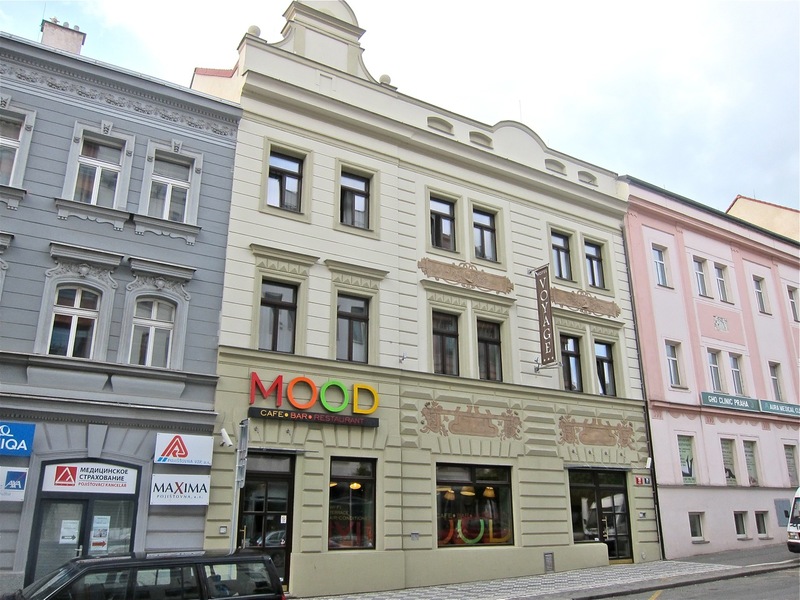 The good-looking building and brightly colored signage stand out on the otherwise rather dingy Koněvova street. 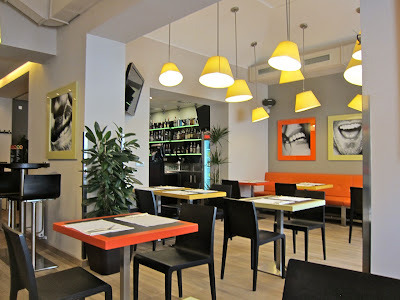 The interior has a pop art feel, with spare, modern furniture, more bright colors, and odd, eye-catching photos of toothy smiles on the walls. I particularly liked wide-planked hard wood flooring. 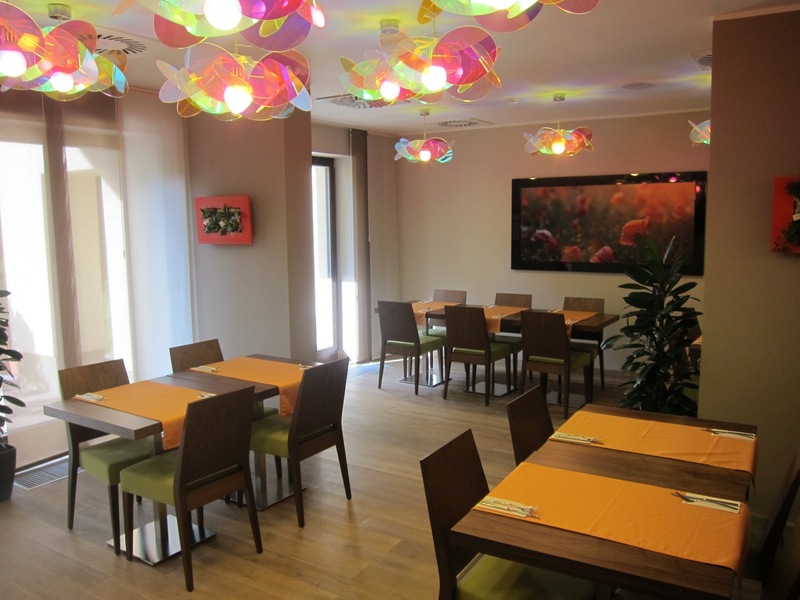 There is a rear dining area that is a little more woody when it comes to the chairs and tables than the front. On the way there, you can take a look through a window into the brand new, ultra modern kitchen. When the weather was warm, my favorite spot was the back terrace. You take in the greenery and watch the bikers, rollerbladers, and strollers gliding through the park under the Vitkov National Memorial. On my first visit, I sat in front. I drove my car since there is plenty of free, white line parking in front on weekends. Buses run near the restaurant, but it's a 10 minute walk to the nearest tram. Because of the car, I was drinking water. They serve .25 liter bottles of Bonaqua (39 CZK). I wish they'd carry Mattoni instead. I'd heard talk that burgers would be a specialty of this restaurant and I'd enjoyed Cohen's burger at Artisan. 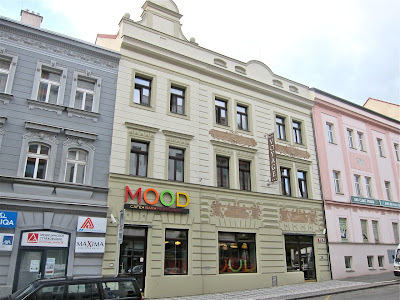 So, I ordered the Mood Classic Burger (215 CZK). 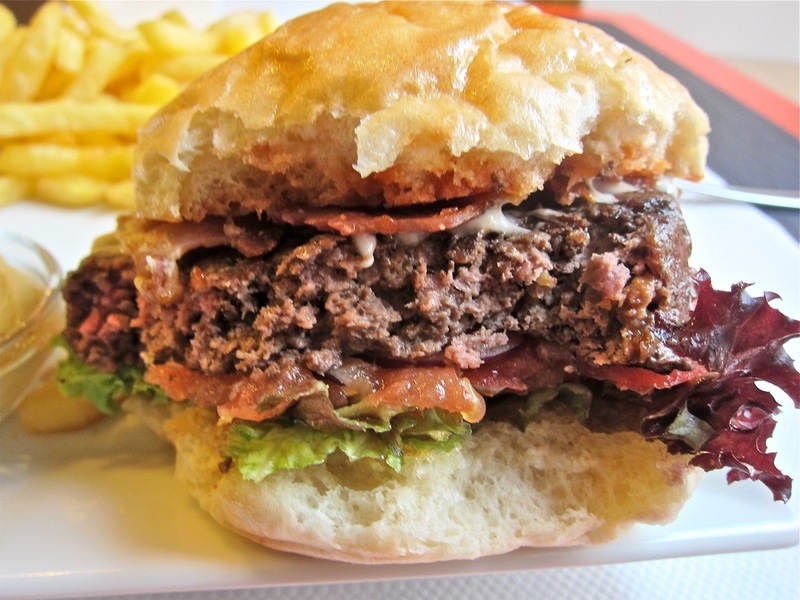 The thick patty, formed from a custom grind, sits on red and green lettuce, tomato, and red onion. On top rested two long, crispy slices of bacon. There was no cheese, although this is available on the Jalapeno Cheddar Burger (235 CZK). I found out the toasted buns are custom-made for Mood at Bakeshop Praha. I'll be frank, I think this is one of the top burgers in the Czech Republic. The top quality ground beef patty is hefty, wonderfully smoky from a lava grill, and just juicy enough, even though it was cooked almost well done (I asked for medium). The bun holds it all together like a champ. The burger comes with little dishes of ketchup, mustard, and mayo. It always bugs me not to get a bottle of ketchup on the table. These small dishes never supply enough for both the burger and the fries. I wished the cool lettuce, tomato, and onion were on the top or the side, rather than under the hot meat. These small details didn't put my love asunder. I have a very high opinion of the burger. For second point of view, I talked to a friend who also tried the Mood Classic Burger. He gave it a full on rave. He even went so far as to say that Mood's is better than the much-beloved burgers at The Tavern. Do I agree? I'm going to wait until my end of the year burger ranking list to reveal my final decision on that. 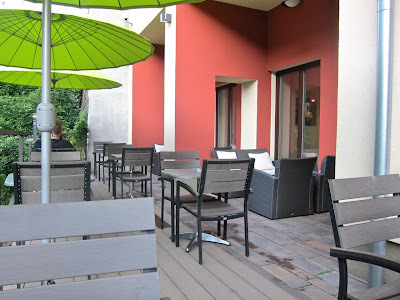 On my second trip, I was on the terrace. 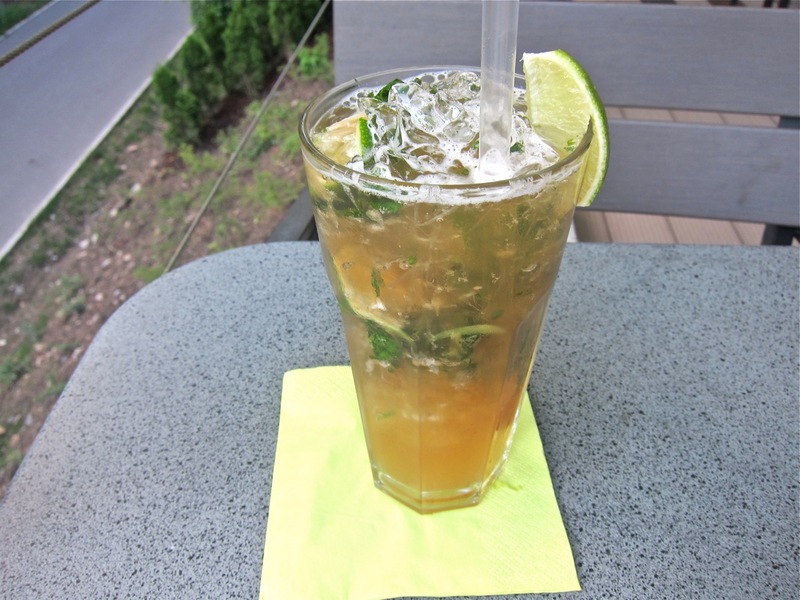 I began with a glass of homemade ice tea (60 CZK). It was lightly sweet and quite tart, with plenty of lime as well as fresh mint leaves. It was refreshing. I tried a bowl of gazpacho (45 CZK). The tomato stood out, and there was a balance of salty and sour. I wished for more flavor from other vegetables like cucumber. I also prefer a thicker texture like the gazpacho I had recently at La Terrassa. I realize there are many ways to make this cold soup. This one was on the thin side. I'd point out that the gazpacho photo on Mood's website shows a soup that appears quite thicker. 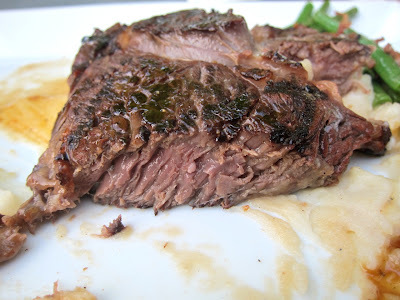 Then I had the pineapple-soy marinated rib eye (365 CZK). This was a quality, very tender piece of beef. Rib eyes are usually so tasty and easy to cut because they are also relatively fatty, so be prepared for that. I did ask for medium-rare, and it was cooked past that point. Although I never met Cohen in Atlanta, I found out he was a chef at my favorite steak house, Houston's, at the same time I lived there. 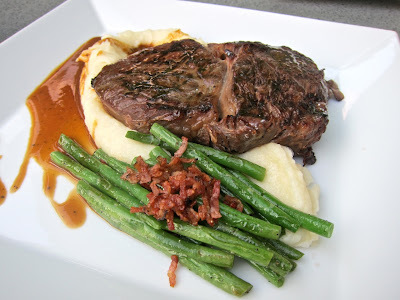 He told me this steak is modeled on their "Hawaiian," which I ordered regularly. That one had a charred, sweet-salty, teriyaki-like crust on it from the marinade. The Mood version is saltier and dominated by the soy sauce, rather than pineapple juice. I assumed this was something of a concession to local tastes. The green beans were fine -- hot but still crunchy and topped with chopped bacon. The mashed potatoes were creamy, buttery, and lovely. The lightly sweet and salty demi-glace sauce on the side was truly excellent. It was plate-licking good. Although full, I felt it my duty to try a dessert. 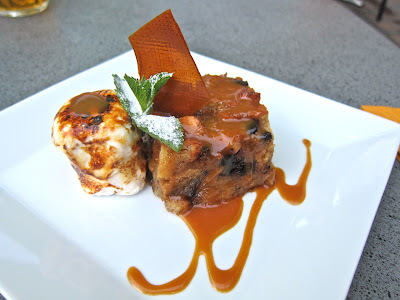 I ordered the bread pudding (110 CZK). This is one of the most decadent sweets you'll find around these parts. The warm eggy bread was studded with pieces of chocolate. Then it was coated with quality caramel sauce, not the nasty, artificial kind. If that were not enough, there was a homemade toasted marshmallow on the side. It was briefly flambéed and tasted like it just came off a stick over a campfire. Amazing. 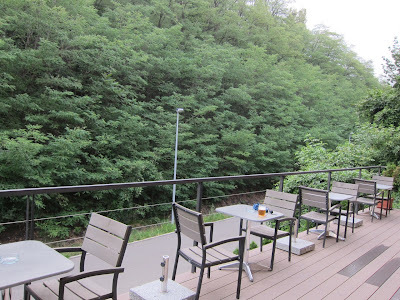 On the third visit, I finally had a beer. 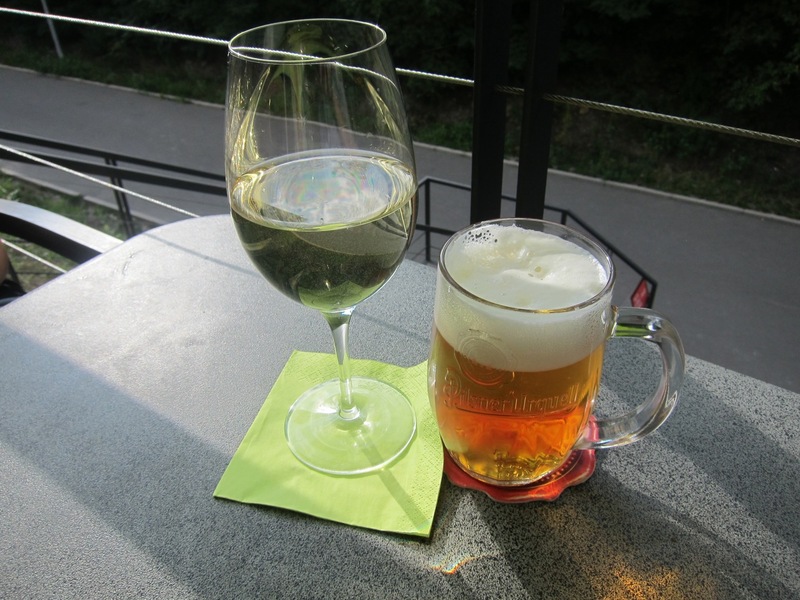 They serve Pilsner Urquell on tap, but only in .33 liter glasses (39 CZK). They also have tapped Krušovice Černé and non-alcoholic Bernard. My Italian companion had a fruity, dry .2 liter glass of Sauvignon (88 CZK). I had the buffalo wings (95 CZK). They had a crispy skin, with tender, juicy meat underneath. One can choose mild, medium, or hot. I chose medium, but they were so mild, I wished I went for maximum heat. 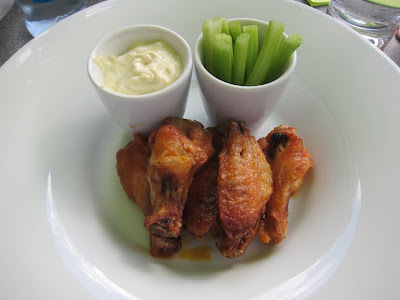 There was a cheesy blue cheese sauce on the side with celery sticks. I wished for carrot sticks in there, too. My date had the mussels (195 CZK). We both thought the mollusks were not of the highest quality, some with a rubbery texture, some tasting less fresh than others. Hopefully that was a one-time problem or a sourcing issue. 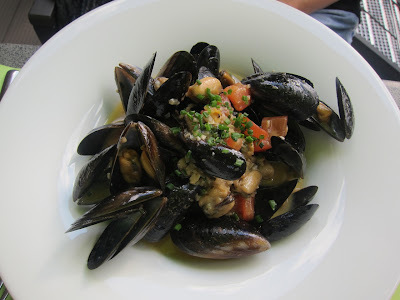 I hope that gets fixed, because the sauce that went with these mussels was crazy good. It was one of the most buttery I can remember, so if you're on a diet, forget it. Also it had an almost lemon-like tartness that comes from reducing the serious amounts of white wine. I was soaking it up with bread, but had to stop because it was too rich for me. For myself, I had the club sandwich (195 CZK). It looks nice, but it didn't work for me. Double-decked white toast was layered with tomato, rucola, avocado, red onion, smoked turkey, and mayo. You don't see it in the photo, but there was an overwhelming amount of very strong, raw, sliced onion. I picked a lot out, but since it mixed with the mayo, it was hard to get it all without a majorly messy operation. That said, I'm sure they'll make it without onions on request. That wasn't the only issue. The smoked turkey breast, although quite smoky, tasted like the rubbery and insubstantial supermarket variety. 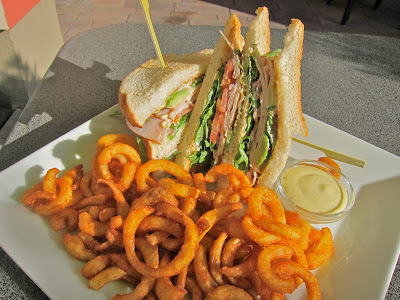 Although there is no law saying a club sandwich should have bacon, I'm one of those people who think there should be. I had to go back one more time for no other reason than there were still several items on the menu that piqued my curiosity. 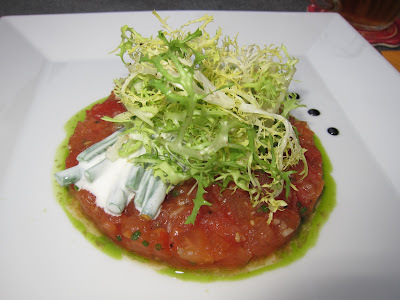 I started off with the tomato tartare (145 CZK). This I liked. It had a healthy hit of basil and lime juice, which worked well to bring up the flavor of the tomato. There was a hint of shallot. On top were crunchy green beans mixed with cream and vinegar. 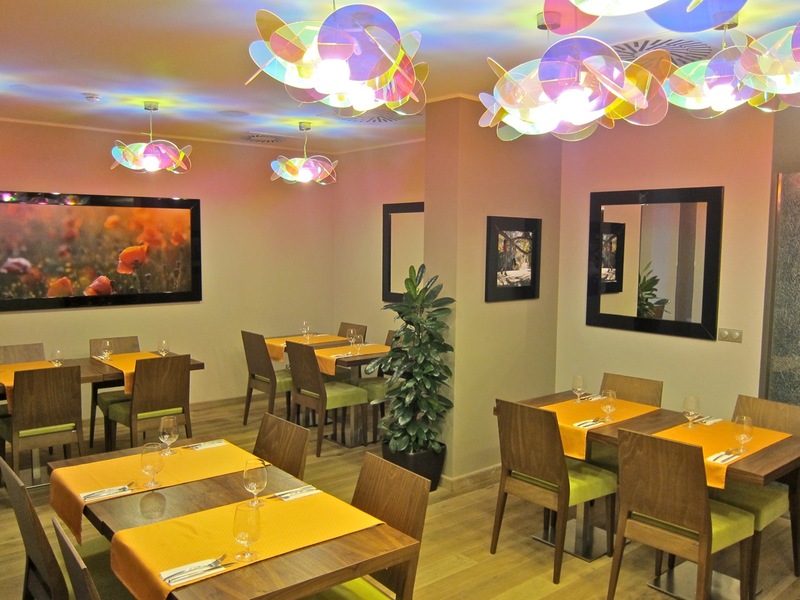 Last but not least, I went for the barbecued ribs (185 CZK). These were real baby backs and they were cooked just right. The tender, silky pork peels off the little bones. No knife or fork required. You do get a water bowl with lemon on the table for washing up. The ribs were coated with a thick, sweet sauce. It's an imported variety that Cohen jazzes up with molasses, brown sugar, and sambal chili sauce for a mild kick. Some might find the sauce too sweet or too generously applied. I didn't. 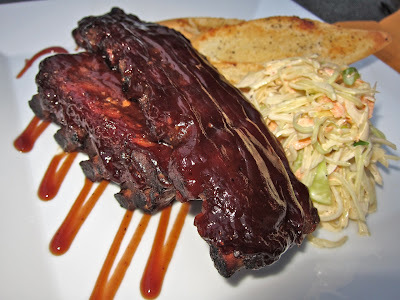 These small but satisfying racks come with coleslaw that, unlike some American versions, was on the savory side. That's a good thing, given the sweetness of the meat. Since Cohen knows me, I did my best to sneak into the restaurant unnoticed. He often walks the floor of the dining rooms, so he usually found me half-way through the meals. I did take the opportunity to ask him detailed questions about what went into many dishes. I had different waiters on two of the four visits. Service was always quite good. I leave it to others to judge whether I had a different experiences than regular guests. 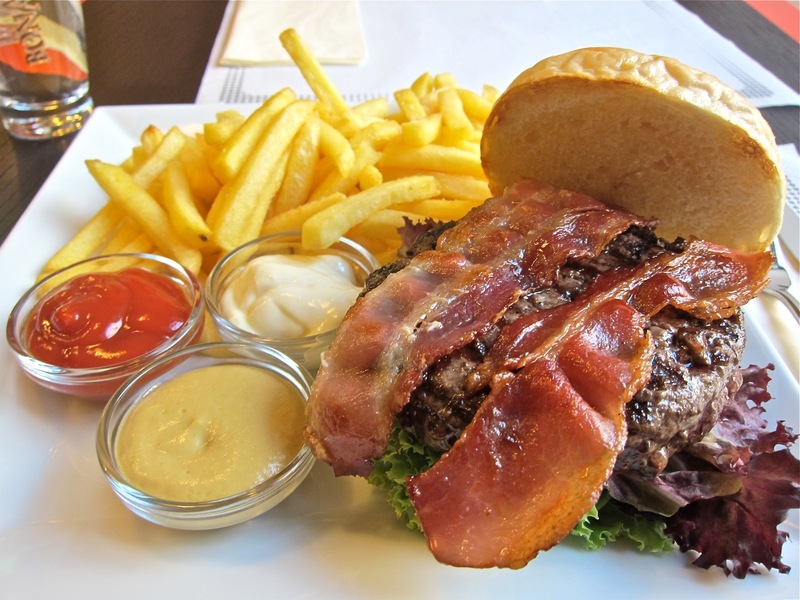 Burgers, ribs, club sandwiches, wings, and rib eyes are available in many places around Prague. But a lot of the "American" food tastes decidedly un-American. 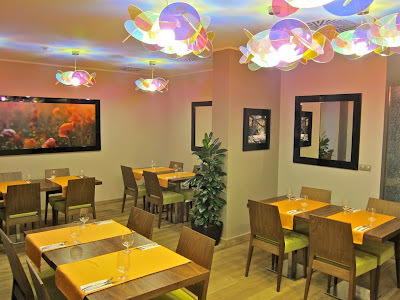 Mood has an American-style menu designed by an American chef. And it tastes like it. Of course, I wish every dish was a home run, especially with offerings that remind me of home. But more than enough of the food hit me in my strike zone -- especially that burger. I'm sure I'm going to be in the mood for Mood again soon. 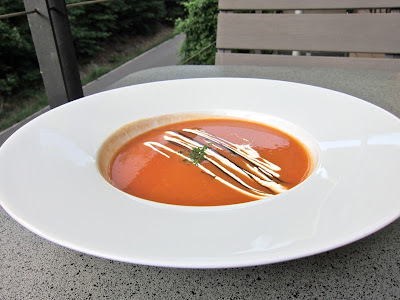 is gazpacho an american dish or a spanish one ? if they put the ketchup bottle on the table, then everyone would do just like u said, put a lot more, which will increase their costs. Ketchup bottles are on every table in even the lowest dive bar- restaurants in America.I also find it annoying to be served ketchup in minuscule thimbles in Praha.If you claim to be an American restaurant please bring a bottle of ketchup for my fries.Its a condiment,its not saffron or black truffles for goodness sake. And your comment on Club sandwiches is dead on. I believe its the 22nd amendment to the Constitution that states "Bacon must be served with every Club Sandwich"